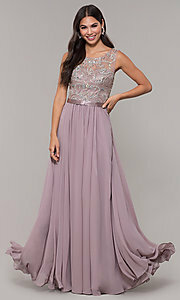 Twirl in this mocha purple prom dress for a soft regal look at a prom or gala. This long formal dress features a scoop-neck illusion-sweetheart bodice accented with a swirling pattern of color-catching iridescent beading. With a slight spin, the sheer-back feature reveals that the beading continues to shine. A gleaming band defines the natural waistline and tops the satin-lined long chiffon skirt that flows to the floor-sweeping hem of the long purple evening dress. 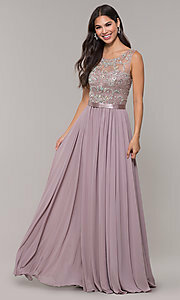 At under $200, this mocha prom dress shines for formal occasions.